My article on challenges confronting the Indian IT majors was published in DNA in January 2015. Hidden among the noise surrounding the big three of the Indian IT industry - TCS, Wipro, and Infosys - was a very interesting sliver of signal that points to possibly big changes on the horizon. Though Cognizant should be counted among these biggies - based on its size and revenues - let's focus on these three for the time being. Statements made by the respective CEOs of Infosys and Wipro, and the actions of TCS, provide hints on how these companies plan on addressing the coming headwinds that the Indian IT industry faces. Make no mistake. 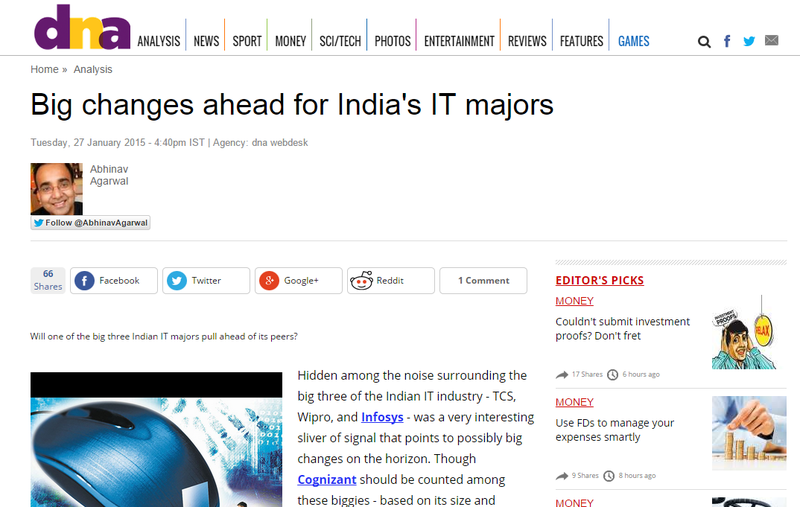 These are strong headwinds that threaten to derail the mostly good fairy tale of the Indian IT industry. Whether it is the challenge of continuing to show growth on top of a large base - each of these companies is close to or has exceeded ten billion dollars in annual revenues; protecting margins when everyone seems to be in a race to the bottom; operating overseas in the face of unremitting resistance to outsourcing; or finding ways to do business in light of the multiple disruptions thrust by cloud computing, big data, and the Internet of Things, they cannot continue in a business-as-usual model any longer.